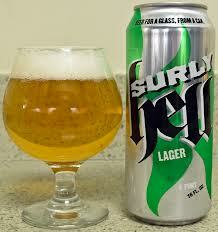 Like most people who have tried their beers, I have really taken a liking to Surly’s product (www.surlybrewing.com). Furious, Abrasive, Bender, and Coffee Bender are all fabulous beers that I’ve tried from them. Lately, a buddy and I have taken to ordering some beers from places like france44.com and halftimebeverage.com. France44 works out really well if you are in the mood for some Surly beers and with my buddy’s latest order he took a shot on a Surly beer neither one of us had tried yet. Finally, a Surly beer my German mother will drink. She says this one tastes like a bier from back home. Not unlike a Zwickel Bier from Germany, Hell is our filtered and fermented with lager yeast, American hops takes a back seat to the Pils malt sweetness and fresh bread aroma. The color is well… hell (Deutsch for light). It’s fiendishly drinkable, and you don’t have to sell your soul to get another. The style of this beer isn’t one that is often talked about currently. IPAs, barrel-aged, sours, are dominating headlines with most craft beer drinkers but if you want to try different styles and try them when they are done right, I think Surly can be proud of this beer. This could also quite possibly be a great transition beer for those looking to get into the craft beer world. Rumblings of Surly wanting to expand a bit continues through the midwest and here’s hoping that they make it south to the lovely state of Iowa. Pour: Golden straw color with a thick white head. Aroma: Bread, yeast, light citrus. Flavor: Lots of breadiness with lemon and bit of hops. My recommendation: A great beer for the style, extremely drinkable. Surly continues to do things and if you can get up north to Minnesota to get some, buy a bunch, or order from france44.com.